Believed to be the first alcoholic beverage, mead was once referred to as “the nectar of the Gods.” And those who have tried a well-executed mead will understand why. This beverage that is created by fermenting honey with water, and features spices or fruits, is quickly making a comeback, largely due to the ever-growing craft beer scene. Today, beer enthusiasts are seeking out what many consider to be the next frontier as meaderies have begun to pop up throughout the country. For those of you who are looking to join the movement, there are a few meaderies we think you should check out. Ken Schramm has led the charge for mead ever since co-founding the Mazer Cup Invitational in 1992. While the number of meaderies have increased tenfold since then, Ken has continued to push the envelope since opening Schramm’s in 2013 and has become known for his elegant fruit-forward meads, some of which come from his own orchard. For Ken, the endless exploration of the interplay between fruit and honey is something that is still in its early stages. Currently, he’s been looking at how to work in fruits such as mango, rhubarb and even papaya into his portfolio. While Schramm’s has released some incredible meads, including their first ever barrel-aged mead recently, it’s their seasonal offerings that keep us coming back for more. While everything Schramm’s releases is incredible, two of our favorites are Red Agnes and Blackberry. Red Agnes: Those familiar with Schramm’s have probably heard of Black Agnes, Ken’s black currant mead, and what many refer to as the golden standard of fruited meads. This past year, Ken (with a solid push from his daughter Alyson) released the first batch of Red Agnes, one of the few Schramm’s meads that went straight from pilot batch into larger production. Pouring a beautiful red color, Red Agnes provides a tame currant aroma followed by an incredible mouthfeel that starts off sweet and slightly tart with a lingering fruit-filled backend that will leave you wanting more. Blackberry: Ken has been producing his Blackberry mead for several years now. The inspiration dates back to when his late friend Larry Yates and his wife invited him to try and use some of the blackberries they grew on their property. Several years later Blackberry continues to be one of his best aging meads, and a staple in Ken’s portfolio, giving off a pungent blackberry aroma, and like all of his offerings, a fruit-filled assault to your palate. For co-owner Jeff Herbert, becoming one of the most renowned mead-makers in the world was never the original plan. It took a screenplay, a trip to Borneo, and a sip of Chimay in Brussels to convince him that maybe he should give the whole homebrewing thing a shot (that’s the nutshell version). Five years ago, after taking a course at the Siebel Institute on how to start a brewery, and entering many competitions, Jeff and his wife and co-owner Jen moved to Arizona to make their dream a reality. In 2014, Superstition opened as an alternating proprietorship with a winery after a year of proving themselves as volunteers at the winery, and pumped out 300 gallons. Of course, once things began to roll, the winery closed, leaving Jeff and Jen to build what is now their current location. Today, Superstition is still expanding; they are opening a new facility, which will move their current capacity from a little over 6,000 to 100,000 gallons. Two favorites from Superstition are their signature mead Marion and a relatively new offering Peanut Butter Crime. Marion: As one of the 2016 Mazer Cup Golds for Superstition, Marion includes equal parts blackberries, raspberries and blueberries, giving off an incredible berry aroma mixed with that signature earthy nose you find in all Superstition Meads. The mouthfeel is rich, decadent, syrupy and fruity and goes for days. It finishes with a slight tartness. Peanut Butter Jelly Crime: Last month, Superstition released one of their newer meads, Peanut Butter Crime Jelly, to the public and it sold out in just a day. Don’t worry, this month a much larger batch will be sold at the meadery and online. The mead gives off a distinct nutty and red wine-like nose. The mouthfeel is a rush of blueberries followed by the taste of crushed peanuts on the backend. Founded 10 years ago by Brad and Kerri Dahlhofer and their friend Paul Zimmerman, B. Nektar has come a long way from their 1,200-square-foot basement meadery. Today, B. Nektar is one of the largest and most recognizable names in the mead industry with an incredible 26,000-square-foot location that includes a new taproom. While they started out making more traditional styles of meads, they have now turned their focus to include several types of session meads and ciders that you can find in many locations around the country as well as, of course, their taproom in Ferndale, Michigan. While their portfolio is endless, two of our favorites from them are Cherry Chipotle and #Dragonsarereal. Cherry Chipotle: A seasonal release from B. Nektar, Cherry Chipotle provides an unlikely combination that has become a favorite among their followers. On the front-end, this mead presents an initial punch of cherry to your palate, followed by a kick of chipotle that lasts. 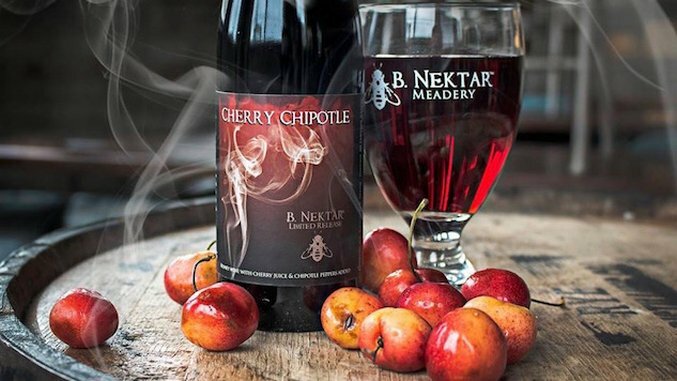 #Dragonsarereal: Taking Cherry Chipotle to the next level, B. Nektar aged the previous mead in barrels that contained Dragon’s Milk from New Holland Brewing and then added cacao nibs. Pouring a light red color with faint carbonation, this mead provides a faint cherry nose with a touch of spice. Compared to the Cherry Chipotle, the mouthfeel is a little bit of everything with a smooth chocolate cherry mouthfeel. One of the most exciting new Meaderies on the horizon is Garagiste Meadery, which isn’t even open yet. Technically, they don’t open until next year. But led by Chad Wiltz and his wife Sarah, Garagiste has been turning the heads of mead fans this year after the largest crowdfunding campaign in mead industry history. Once the Meadery in Tampa Heights opens, visitors will be able to hang out and enjoy meads on tap within view of the production facility. Two of our favorite meads Garagiste has released thus far are Goober Grape 2.0 and Black Widow. Goober Grape 2.0: What began as a challenge to make a bold peanut butter and jelly inspired mead, Goober Grape 2.0 ended up being what truly put Garagiste on the map. After a Gold medal at the Mead Free or Die international competition, Garagiste has continued adapt the PB&J concept to include versions using strawberry and raspberry with a blackberry version in the works now. The nose of this mead is straight chunky peanut butter. The flavor has notes of grape jelly followed by a rush of peanut butter, taking us back to those PB&J sandwiches we had as a kid. Black Widow: Garagiste’s most awarded mead combines black currant, red currant, raspberries, blackberries and a blend of tart cherries which are then aged on oak staves and vanilla beans. One of the most complex meads you can find, it gives off a huge presence of vanilla on the nose. The mouthfeel is thick and chewy, as the interplay between all the different fruits and vanilla develop into what is truly a work of art.